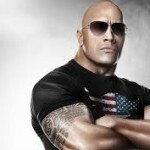 Dwayne Johnson AKA ex-wrestler The Rock has found further fame in film. Thanks to The Scorpion King, Fast & Furious 6 and G.I. Joe: Retaliation, Johnson can now add “actor” to his resume. 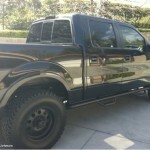 Like Johnson’s enormous arms and torso, his ride mirrors his bulk in the form of his black Ford F150 truck. He aptly named her the “Black Gorilla”.